Dormosedan® Injectable is indicated for use as a sedative and analgesic to facilitate minor surgical and diagnostic procedures in mature horses and yearlings. It has been used successfully for the following: to calm fractious horses, to provide relief from abdominal pain, to facilitate bronchoscopy, bronchoalveolar lavage, nasogastric intubation, nonreproductive rectal palpations, suturing of skin lacerations, and castrations. Additionally, an approved, local infiltration anesthetic is indicated for castration. For Sedation: Administer Dormosedan Injectable IV or IM at the rates of 20 or 40 mcg detomidine hydrochloride per kg of body weight (0.2 or 0.4 mL of Dormosedan ® per 100 kg or 220 lb), depending on the depth and duration of sedation required. Onset of sedative effects should be reached within 2-4 minutes after IV administration and 3-5 minutes after IM administration. Twenty mcg/kg will provide 30-90 minutes of sedation and 40 mcg/kg will provide approximately 90 minutes to 2 hours of sedation. 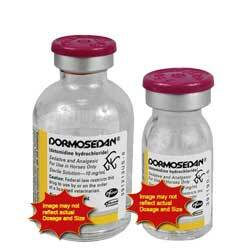 For Analgesia: Administer Dormosedan ® IV at the rates of 20 or 40 mcg detomidine hydrochloride per kg of body weight (0.2 or 0.4 mL of Dormosedan ® per 100 kg or 220 lb), depending on the depth and duration of analgesia required. Twenty mcg/kg will usually begin to take effect in 2-4 minutes and provide 30-45 minutes of analgesia. The 40 mcg/kg dose will also begin to take effect in 2-4 minutes and provide 45-75 minutes of analgesia. For Both Sedation and Analgesia: Administer Dormosedan ® IV at the rates of 20 or 40 mcg detomidine hydrochloride per kg of body weight (0.2 or 0.4 mL of Dormosedan ® per 100 kg or 220 lb), depending on the depth and duration of sedation and analgesia required. Before and after injection, the animal should be allowed to rest quietly.